Months later the debate continues into Winter 2010 – Anyone who attends the Terry Fox Run or Residents of Port Coquitlam can express their remarks to the City Hall or the Media. PNG / Rogers Communications intends to erect a 50-metre cellphone tower that would loom over the grave of national hero Terry Fox, as well as the graves of many others in the Port Coquitlam Cemetery. There is no requirement for public consultation. Canadian hero Terry Fox was buried in Port Coquitlam Cemetery in 1981 after succumbing to the cancer that inspired his attempt to run across Canada to raise money for research. Fox’s epic journey ended unfinished, although the 5,373 kilometres he covered in 143 days is nearly equivalent to running a daily marathon. His inspiring story of overcoming the amputation of his leg to attempt such a feat has raised nearly $500 million over the years and was a highlight of the opening ceremonies for the 2010 Paralympics. Yet five days earlier, Port Coquitlam’s council moved a step closer to allowing construction of a 50-metre (164-foot) cellphone tower that would loom over the very cemetery where he is buried -a sight that the city’s own website describes as being of both national and historic interest. 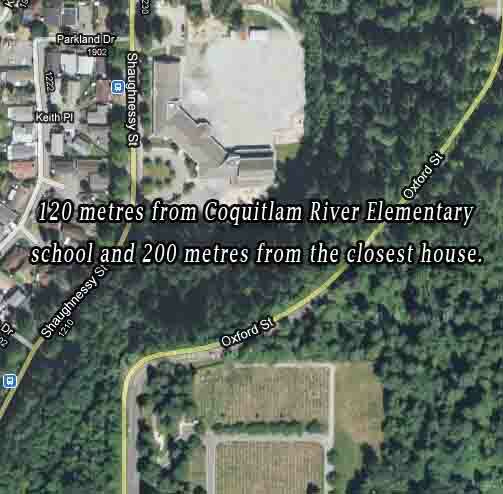 It also bears noting that the tower also would be only 120 metres from Coquitlam River elementary school and 200 metres from the closest house. Fox’s burial site is listed as one of the city’s attractions and is one of 10 virtual tours on its website ( www.seevirtual360.com/themes/2/theme02.aspx?listingID=8720). If the city agrees to lease the land for $25,000 a year for five years (with the potential to renew it in five-year increments for 20 years), Rogers Communications’ tower would stand more than 10 metres higher than the trees at the cemetery’s perimeter. The top of the tower would be loaded up with antennae and that’s what would be visible from the cemetery. In every culture, burial grounds are considered sacred. They are set aside to honour the passage of lives and times. They are places of remembrance and quiet contemplation, in addition to being repositories of historical data and even nature conservancies. And even many of those that hold the remains of the most famous and infamous, such as the Cimetiere du Pere Lachaise in Paris or Forest Lawn in Los Angeles, still retain a sense of dignified calm despite a steady flow of visitors. Yet history teaches that cemeteries are not immune to the pressures of progress. The New Westminster school board would not be having so much difficulty getting its new secondary school underway had the city’s council nearly 100 years earlier not chosen to allow construction on a cemetery site. It wouldn’t have been necessary for the new secondary school’s site to have been rededicated as a cemetery last year. Of course, this is a tower that Port Coquitlam council is suggesting may just be temporary and may be long gone before graves need to be dug close to its base. However, it also appears to be the first time that a Canadian telecommunications company has proposed building a tower at a cemetery, raising an important question about how we value the resting places of the dead. But the public has no real chance to participate in that discussion. The city will not hold public hearings. Surprisingly, a telecommunications tower fits within the current zoning and the Official Community Plan. Rogers must consult the public to meet Industry Canada’s regulatory requirements – but Industry Canada doesn’t require a public meeting or even any indication of overwhelming support for the plan. It requires only that Rogers provide it with a newspaper advertisement and copies of the information package that it has sent out to property owners within a radius that’s three times the height of the tower. Industry Canada requires Rogers to respond in writing to all “reasonable and relevant” questions, comments and concerns within 60 days. And since Rogers runs the process without any oversight, it gets to decide which of those comments are reasonable and relevant. Industry Canada isn’t interested in either the questions or the answers. But as even the city of Port Coquitlam is aware, this particular cemetery is of concern to a much broader public. It is where a national hero is buried. Do we really want the grave of one of the country’s most beloved citizens to be overshadowed by a cellphone tower? And even if Terry Fox weren’t buried there, shouldn’t we at least question the appropriateness of erecting a tower alongside the graves of hundreds of other families’ children, fathers, mothers, sisters, brothers? This entry was posted on November 25, 2010, 9:39 am and is filed under British Columbia, cancer, cell tower, cemetery, Coquitlam, health and safety, Port Coquitlam, school. You can follow any responses to this entry through RSS 2.0. You can leave a response, or trackback from your own site. did you know there is another cell tower up there already but further up the hill, its been there for years plus there are large apartment buildings with cellular antennas on the other side of the river to the west, Do they reallllly neeeed another tower there or do they just want more money coming in??? There are also a tonne of cell towers just a few blocks south at Shaughnessy Station Mall – a big one at Safeway and the at least 3 at the railway yard, Tonnes of coverage there. If i were Terry I woud be really upset that this was going on!!!!. shame on you cell phone industry, shame on you!!!!! Citizens have a choice, if they are Rogers customers, drop them, as I have. We do not need to support these Monsters by buying what they’re selling. The tower by the grave of Terry Fox is a monstrosity and shows absolutely no respect whatsoever to anyone or anything, save for the money they line their pockets with.